Deformers can be used to deform a single drawing layer or a hierarchy of layers, so a single deformer can be used to deform anything ranging from a simple prop to a whole character rig. They can be used on both vector and bitmap drawings. Deformers work by rigging them as a parent drawing(s) you wish to deform, building the deformer structure, then animating it. This can be easily done using the Rigging tool. 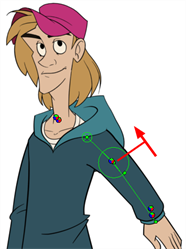 The Curve deformation allows you to deform parts of a character using a vector curve. 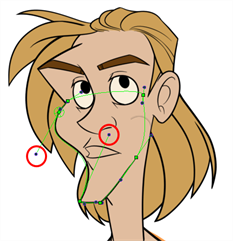 By manipulating the curve's points and their bezier handles, you can change the curve's direction, shape and length, and Harmony will deform the drawing to match the curve's shape. 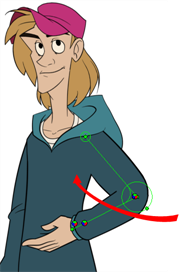 Curve deformations are mostly used to animate elements that don't have joints, such as hair bangs or facial features, or body parts with so many joints that they seem curved, such the torso. They can also be used to animate the limbs of characters in a rubber hose style of animation, where arms and legs are bent in curves. The Envelope deformation allows you to deform an image using Bezier handles located all around the contour of the shape. Envelope deformation chains are composed of Curve deformation nodes. It is regularly used to deform shapes, such as hair, cloak, shoulder shape, head shape and so on. You can use the Envelope deformation to deform a drawing so it looks like it changes from a profile view to a front view to create head and character rotations using only one set of drawings. 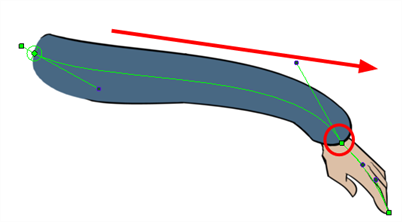 The main differences between the Curve and Envelope deformers is that the Envelope chain can be closed by connecting the last Curve deformation node to the initial Offset point. Once connected, the Offset point no longer repositions the entire chain, only its own control point. NOTE: It's not recommended to use the Envelope deformations on bitmap images and textures. The Game Bone deformation is very similar to the Bone deformation. It allows you to create a bone-like structure in which each part is solid, but with articulations that are flexible. However, it is optimized for game engines such as Unity. Hence, it is usually only used for game development and not in animated productions. Contrary to the Bone deformations, Game Bone deformations do not have Bias and Region of Influence properties. The articulation folds also look slightly more rounded. A deformer is a hierarchy of its own. When you create a new deformer, the first point you set is the deformer's root, and each new point you create is a child of the previous point. Deformers are hence created in a chain, and should be created with your character's hierarchy in mind. 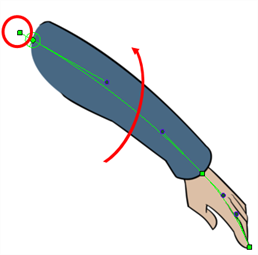 For example, when you create a deformer for an arm, the root should be the shoulder joint, the second point should be the elbow and the third should be the wrist. 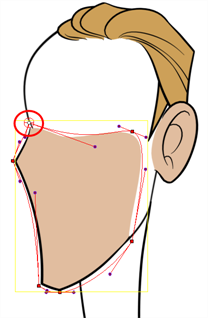 When you create a new point using the Rigging tool, it is created as a child of the selected point. 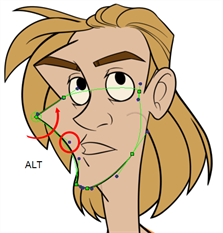 This is essentially how the Rigging tool knows if it's creating a new deformer, or building an existing deformer, as the last point you created will be selected by default. But you can also use this mechanism to create deformers that split into multiple chains, by selecting the point in the middle of an existing deformer, and building a new chain from there. Adding several deformers to your scene is liable to make its layer structure appear heavy in the Timeline and Node views, as every deformation point is a layer of its own. 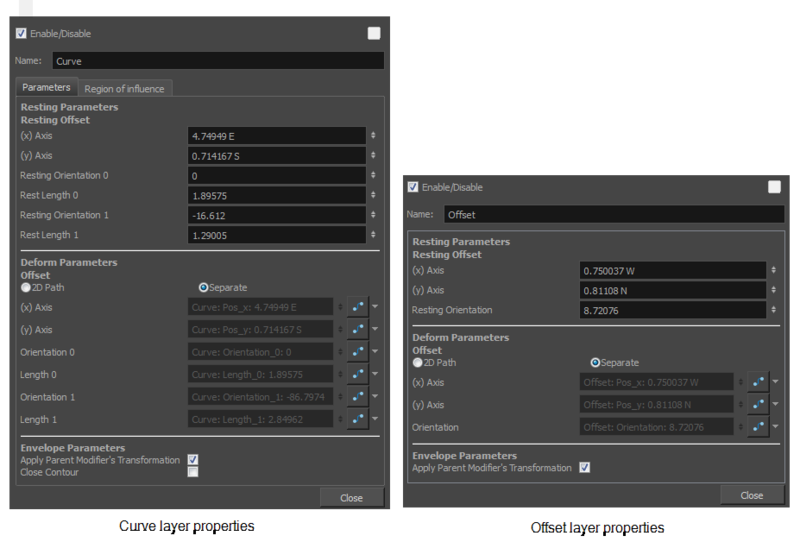 Hence, it is recommended to have the Automatically create a group when creating a new deformation rig option enabled in the Tool Properties view before building a deformer. This will create deformers within groups created specifically to contain their structure, making the resulting hierarchy appear a lot lighter. NOTE: You can also use the Node Library view to manually add the nodes necessary to create your deformation structures. 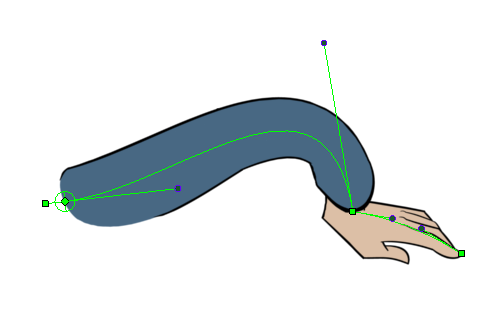 For example, if you wish to create a deformer for an arm, and the arm is broken into several layers, you could rig the arm in a hierarchy where the upper arm is the root, the forearm is the upper arm's child and the hand is the forearm's child. 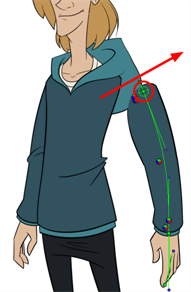 Then, if you create your deformer on the forearm, it will be created as a parent of the forearm, and will hence affect the whole arm, as its other parts are children of the forearm. Once your element is selected, select the Rigging tool in the Deformation toolbar. 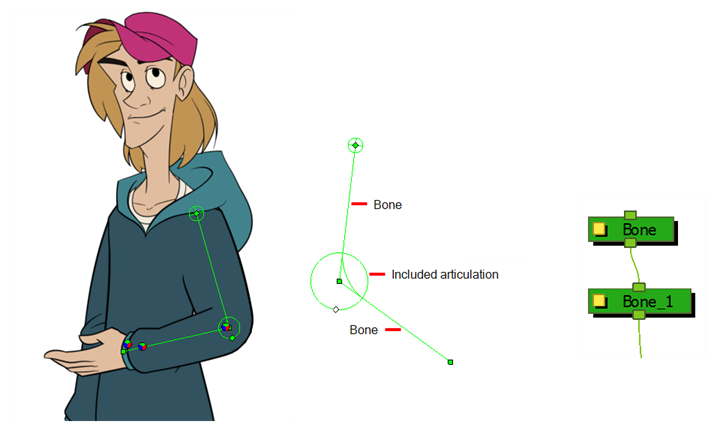 In the Tool Properties view, enable the Bone mode or the Game Bone mode, depending on whether you're rigging for an animation project or a game—see About Deformation. In the Tool Properties view, enable the Curve mode. Place the cursor at the root of your drawing or drawing hierarchy. 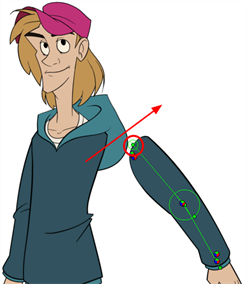 For example, if you're creating a deformer for a whole arm, place your cursor over the shoulder joint. 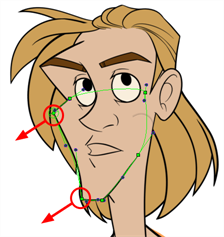 Press and hold the mouse button to create the point, then drag to towards the direction where you want your curve to bend to set the position of this curve's bezier handle, just as you would when drawing a curve using the Polyline tool—see Drawing with the Polyline Tool . 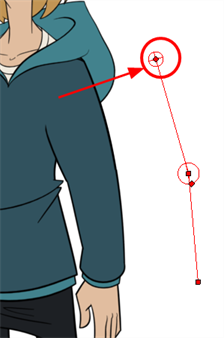 Click again at the location where you want the curve to end and drag backwards to extend the second bezier handle. As you go, you can use your mouse cursor to reposition the existing bezier handles as needed. 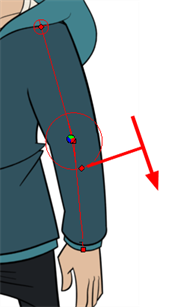 You can hold down the Alt key if you wish to move a point's bezier handle without affecting the bezier on the opposite site of the point. Repeat this process until you have finished building the Curve chain. In the Tool Properties view, enable the Envelope mode. Place the cursor where you want to start creating your envelope. 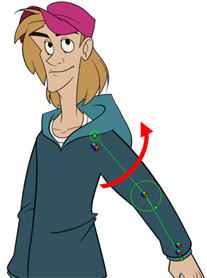 Working as you would when building a Curve deformer, continue adding control points around your shape. 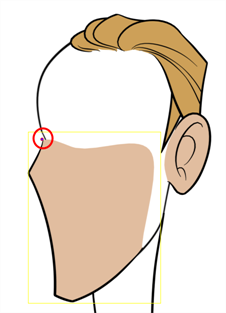 You can place your control points slightly outside of your contour line. When you're ready to close Envelope deformer, hold down Alt and click on the first point of your deformation chain. NOTE: It's not recommended to use the Envelope deformers on bitmap images and textures. 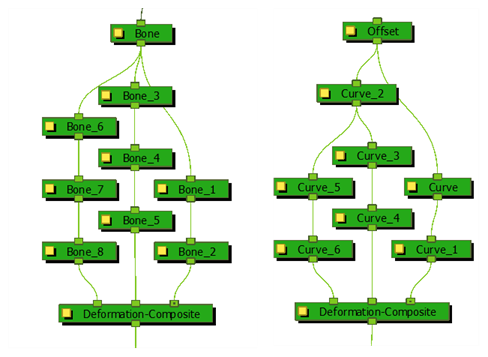 In the Timeline or Node view, select the deformation group or any part of the deformation chain you want to display. In the Camera, Timeline or Node view, select one of the drawing elements linked to the deformation chain you want to display. 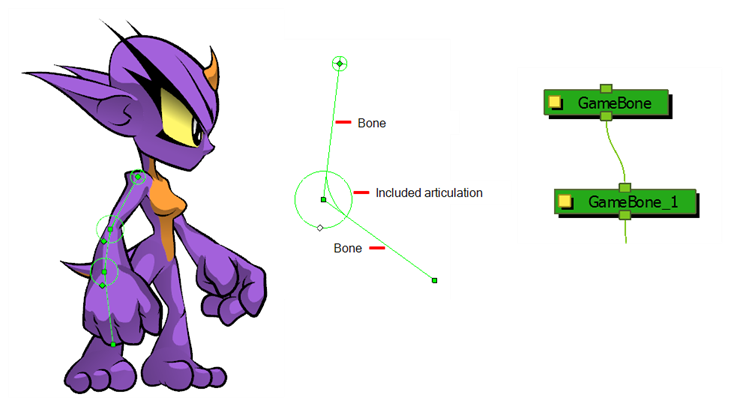 NOTE: You can only insert new articulations inside Bone and Game Bone deformations. It's possible to create a deformation chain that splits into multiple branches, allowing to rig complex drawings with multiple extremities using a single deformer. Note that it might be difficult to ensure that the parts of the drawing being deformed mesh properly in the area where the deformation branches meet. In the deformation chain, select the point from which you want the new deformation branch to start. Place the cursor where you want your new branch's first point to be and click. A new chain is created. Create the remainder of your chain's points as you would create a regular deformation. When you have several chains controlling the same drawing or group of drawings, a Deformation Composite node is automatically be created. Just like with animating pegs and drawing layers, you can animate your deformers by creating keyframes on their corresponding layers in the Timeline. Animating deformers works exactly like making modifications to a deformer, except it requires using Transform tool instead of the Rigging tool. 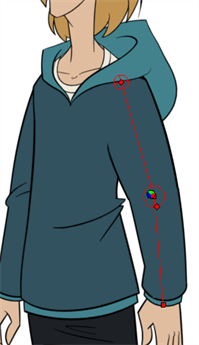 When the Transform tool is selected, deformation controls in the Camera view display in green, which means they are in animation mode, whereas when the Rigging tool is selected, they display in red, meaning they are in rigging mode. 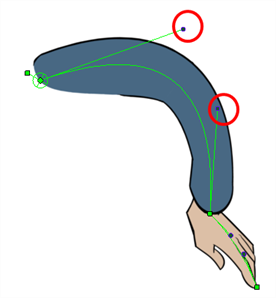 Click on the centre of the deformation's root pivot and drag it around to reposition the entire limb. Use the pivot’s square handle to rotate the entire chain. 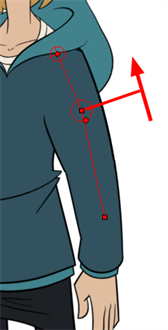 Use the square control point located at the extremity of a bone to stretch or shorten its length. Use the curve handles to modify the shape of the curve. Select the handle you want to move independently from the other. The handle’s colour turns white. The point's colour turns white. Press and hold Ctrl (Windows/Linux) or ⌘ (Mac OS X). Either move the deformation point or rotate one of its handles. 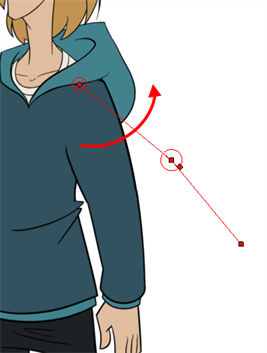 If you move the deformation point, subsequent points will be offset horizontally and vertically. If you rotate one of its handles, subsequent points will rotate around the deformation point. NOTE: You can also manipulate the deformers by typing values directly in the Layer Properties of the Deformation nodes. Move the control points located along the envelope to deform your drawing. Use the envelope's control point handles to modify the drawing`s shape.